When it comes to image editing, resolution is one of the toughest concepts to understand. It’s also the most important concept to grasp when it comes to printing photos that look good. In this article you’ll learn what the heck resolution really is, when you need to worry about it, and how to tie those concepts into your final printed image. To make sense of it all, we’ll start by taking a closer look at your digital photos to see what they’re made of. Open a photo in the image editor of your choice and zoom into it using the program’s Zoom or Magnify tool (in both Photoshop and Photoshop Elements, you can press Command-+ repeatedly to zoom). Before long, you’ll start seeing colored squares. These blocks of solid color are called pixels (short for picture elements), and together they form the image you see onscreen. Depending upon the quality setting of your digital camera, your photo may contain a few hundred or several thousand pixels by width and height. Pixels don’t have any predetermined size—they can be microscopic or honkin’ big. The measurement that controls pixel size is called resolution. Sure, the quality setting on your digital camera determines how many pixels are captured when you press the shutter button, but who knows how big they are? Before you send that photo to your printer, you need to make sure they’re small enough so that they can’t be seen by the naked eye. In printing, resolution is measured in dots per inch (dpi), which makes sense because most printers print dots. For onscreen images—on a computer monitor, TV, plasma, or projector—resolution is measured in pixels per inch (ppi). Resolution controls the size of pixels by determining how many are packed together into a given space (think of it as pixel density). When you increase image resolution the pixels become smaller so more of them can be packed together. This results in a smaller physical print size because the smaller pixels cover less surface area than the bigger ones, though smaller pixels produce a smooth, high-quality print. 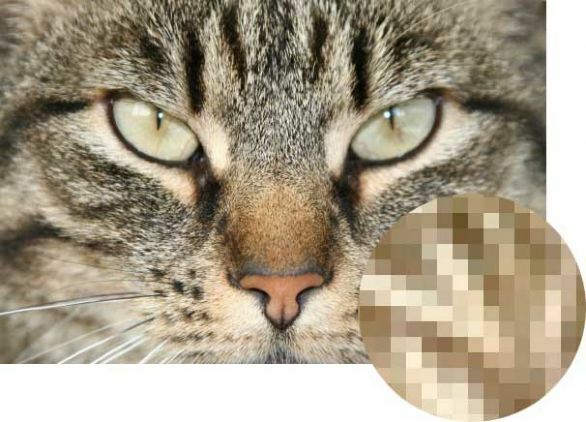 Low-resolution images have fewer pixels packed into a given space, which allows them to be bigger. While this would result in a larger physical print size (the bigger pixels cover more surface space), the print may start to look like it’s made of Legos because the pixels are so big you can see each one individually. This concept is easier to understand by relating it to something in the real world. For example, pretend you’re baking cookies. When you pour brown sugar into a measuring cup, the sugar might reach the one-cup line. But when you pack the granules firmly into the cup, the sugar is reduced to the half cup line. You still have the same number of sugar granules (which are like pixels); they’re just packed more tightly together in the physical confines of the measuring cup (your photo). The loosely packed granules you started with are akin to low resolution, and the firmly packed granules are akin to high resolution. Printers are one of the few devices that can do anything with the resolution measurement. For example, you can print a low-resolution image (72 ppi) and a high-resolution image (300 ppi) and you’ll get different results: one blocky print and one smooth. Computer monitors, projectors, and other digital display devices are altogether different because the video driver—the software that controls what you’re seeing on that screen—is controlling resolution for the display. That’s why a 72 ppi image looks exactly the same as a 600 ppi image, which is why the concept of resolution is so darn confusing—you just can’t see resolution changes onscreen. The truth is that resolution doesn’t mean a hill of beans unless your photo is headed to a printer. If your image is destined for life onscreen—on a Web page, in a presentation, or in a slideshow—resolution doesn’t matter because viewers just can’t see the difference between one resolution and another.